At Smile More Kidz, we’re dedicated to helping young patients develop and maintain healthy smiles that last a lifetime. 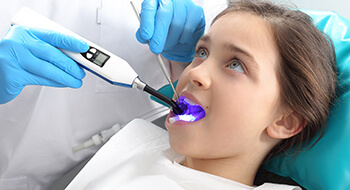 One of the great preventive dental services we provide to strengthen your child’s smile, fluoride treatments can significantly decrease risk for decay, wear, and other oral health concerns. Best of all, these treatments can be applied as part of any regular dental checkup. No need to schedule a special appointment. Fluoride varnish can be applied in just a few minutes at the end of your child's checkup, is completely painless, and keeps kids smiling between appointments. 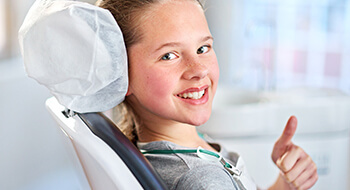 Call to find out more or schedule a dental checkup for your child with Tappan pediatric dentist, Dr. Darren Tong and his Tappan, NY dentistry team. Every day, there’s a war going on in your child’s mouth. You probably had no idea that teeth are constantly fluctuating between a state of remineralization and demineralization. This occurs because the mouth contains thousands of bacteria. These living organisms are part of the digestive process breaking down foods into nutrients our bodies need to function properly. Unfortunately, bacteria also excrete a sticky, acidic biofilm called plaque that can attack teeth breaking down tooth enamel. As this acid attack occurs, saliva works to neutralize the acidic plaque. When the level of acid is higher than the basal, neutralizing abilities of saliva, the result is demineralization. When the oral environment is more basic than acidic, remineralization occurs. Phosphorus, calcium, and fluoride in the mouth work to remineralize teeth in the battle against acids. The reason fluoride is used to strengthen teeth rather than phosphorous or calcium is that it attracts other neutralizing minerals to the teeth accelerating remineralization. At Smile More Kidz, we recommend children who struggle with frequent decay and those who are still developing at home hygiene routines, receive professional topical fluoride treatments during every six-month checkup. These applications are applied quickly at the end of the appointment. We ask that kids avoid drinking or eating for thirty minutes after the application. This allows the fluoride to be optimally absorbed into the tooth enamel where it fortifies your child's smile. In addition to fluoride supplements and varnishes, it’s essential that teeth receive adequate amounts of fluoride daily. 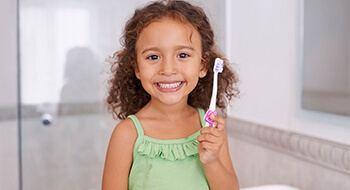 Choose a toothpaste that is approved by the American Dental Association to ensure your child is receiving the maximum benefit from their daily tooth brushing. You can also purchase mouth rinses that contain fluoride to help kids who struggle to brush in hard to reach areas of their smile. In some cases, we may recommend the use of prescription toothpastes or mouth rinses that contain higher dosages of fluoride.